I am based in Goodmayes (IG3). I am Ofsted registered childminder working with my Husband. My husband is also Ofsted registered childminder. We got a GOOD grade in our recent Ofsted inspection (DECEMBER 2018)We have 7 years old girl. Our house is bright, clean, children friendly, pet free and smoke free. And its almost like a small nursury.We provide a safe, happy and welcoming environment for all children and work in close partnership with parents. We provide a happy caring and loving environment where children can learn, play and grow at their own pace. We follow all the requirements set out by the Early Years Foundation Stage (EYFS) and aim to provide a high quality childminding service. Our Availability: All children are welcome from between the ages of 0 to 12 years. We offer 7 days a week and most of the year. We offer the following services: school drop off and pickup, before and after school care, home collection and drop off (during School holidays and term times either Full time or part time). Additional services are available upon the parent’s request. All children will be encouraged to take part in various activities throughout the day whether it is drawing, reading, role play, model making, dressing up etc. I have a fully equipped garden where children can play on slides, climbers, sea-saw, swing,bikes, sandpit,water activity stuff. 4 year experience as a Montessori teacher. 1 year experience as an assistant childminder. £ 5.00 per hour including food, drinks and outing trips.Special discount for full time children.we also offer 15 free funding hours for 2 ,3,4,5 year old children. Below are the latest reviews for Sidra11. Please note that reviews represent the subjective opinions of other Childcare.co.uk users and not of Childcare.co.uk. Parents must carry out their own checks and references on childcare providers to ensure that they are completely happy before enaging in the use of their services. Ms Sidra and Mr Asfad are a very competitive and caring professionals,dedicated in their job and giving our child's the best service provided. They have a very competitive price including meals and very flexible. Their own house for the use premises, it is a very nice , safe and accommodate place for our children. Sidra has looked after my son since aged 8 months. My son is now over 2 years of age and he loves both Sidra and her husband. Sidra has done a marvellous job looking after our son. Sidra is so kind hearted,child friendly and very flexible with timings. Sidra is efficient and very caring. I have no concerns leaving my son and can go to work with peace of mine that my little boy is loved and well cared for. I strongly recommend Sidra she is the best childminder we have been lucky enough to find. All of the children in Sidra's care are jolly and happy at all times and this has helped my son progress in his own development. Thank you so much Mariyum for your kind words. 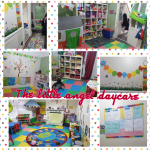 This day care is taken care by both Husband and Wife and I think this is a KEY FACTOR for this place. My daughter is currently going to this place and started more than a year to 1.5 yrs before. They also have one daughter with the same age group of my daughter and this makes much easier for any person to understand the child needs. This family is very caring and flexible to parent’s needs. They have lot of playing options indoor and outdoor. They have proper teaching schedule, discipline eating and sleep routine. During school break they take her to parks and treat her as one of own child. Everyone can take care of a kid but taking care with love and discipline is most important one. There is nothing like our own family members taking care of child but we are from India and we don’t have extended family in UK where we can trust and leave the kid but I can say this is fulfilled with the help of Sidra and Ash. This place is 100% trustworthy and reliable place to leave our little ones. Thank You Sidra and Ash for taking care of my daughter. Thank you so much for your kind words. We are really happy that your daughter is progressing well and ready for school .